One of Intel’s ventures into the historic mainframe space was Itanium: a 64-bit capable processor designed in conjunction with Hewlett Packard. 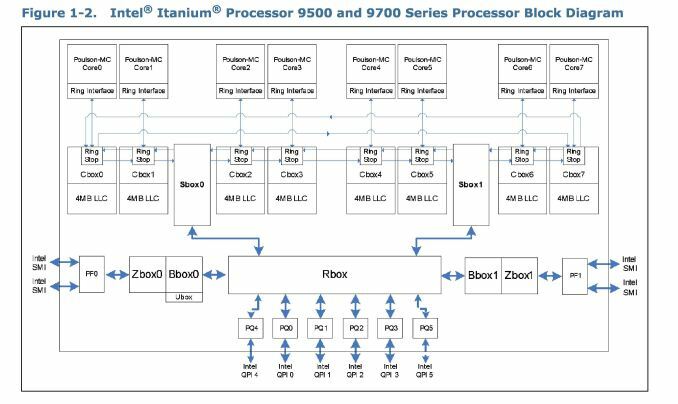 The main reason for Itanium was to run HP-UX and compete against big names, such as Oracle, using a new IA-64 instruction set. The appeal for the original Itanium parts was support for RAS features, ECC, and cores focus on a wide, parallel architecture - the latest cores support 12-wide execution for example. For a short while, there was success: HP’s systems based on Itanium are advertised as high-uptime mission critical servers, and a number of customers cling to these systems like a child clings to their favorite blanket due to the way they are integrated at the core of the company. The main purpose was to compete against other mission critical servers and mainframes based on SPARC and IBM Power. So when the processors were initially delivered to customers, there was potential. However the initial impression was not great - they consumed too much power, were noisy, and needed over the top cooling. Over the years and generations of Itanium, the march into the x86 enterprise space with x86-64 drew potential Itanium customers away, then followed the drop of Microsoft's support for Itanium in 2008, and Oracle's dropped support in 2011. 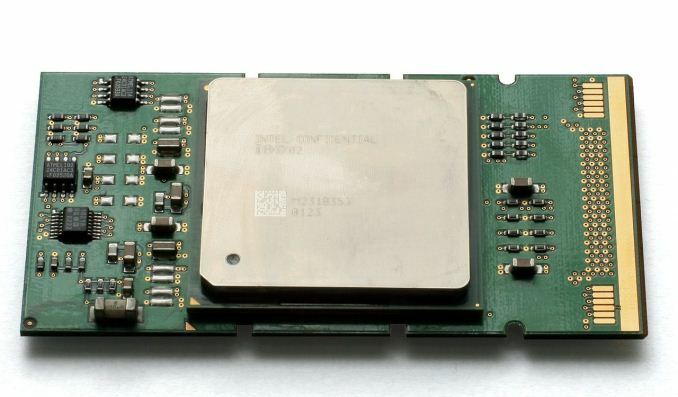 Xeon offerings were becoming popular, with CPUs incorporating the RAS/ECC features required, and Intel decided to slow down Itanium development as a result. 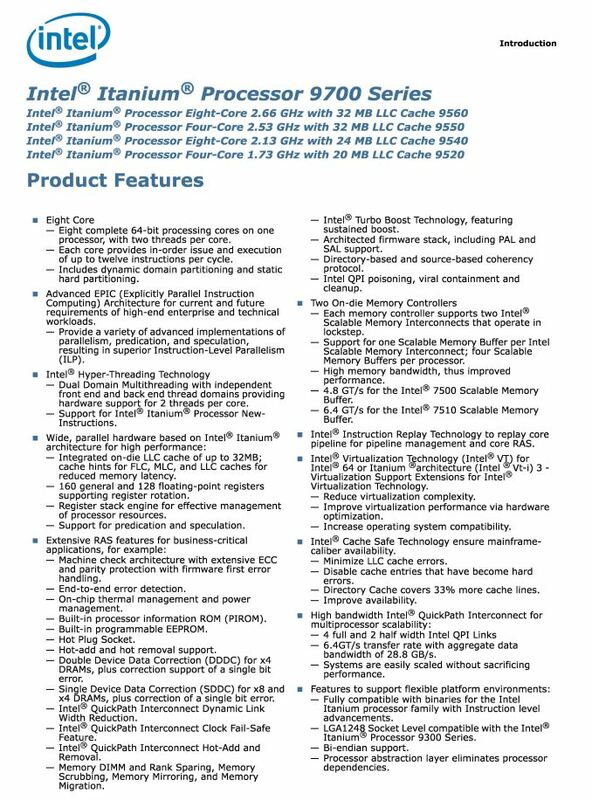 In the meantime, due to the way the market was moving, HP transitioned a good part of its product stack to Xeons. Despite this, legal battles between HP and Oracle ensued given predicted support for HP-UX customers. At this point, there were fewer potential Itanium customers each quarter, although existing customers required support. Today marks the release of the final known variant of Itanium, the 9700 series, beyond assurance testing. Intel spoke to IDG, stating that this generation, code-named Kittson, would be the final member of the Itanium family. These chips are likely to only end up in HP-based Integrity i6 high-uptime servers running HP-UX, and start at $14500. Hewlett Packard Enterprise has stated previously that it will keep support for Itanium-based products until 2025, with the latest OS update (HP-UX 11i v3 2017) coming in June. As for the processors themselves, four 9700 processors form the stack, with quad-core and eight-core parts all with hyperthreading, differing in frequency, power, and L3 cache. *Cost is listed for the equivalent Poulson CPUs. There’s probably something new under the hood, perhaps for a specific end-customer, but at this time Intel is directing anything 9700 related to equate to the 9500 series. Customers still interested in Itanium are directed to HPE resellers.